Today I’m sharing part 1 of my well over due South of France (Provence and Cote d’Azur) travel guide. This is my third iteration of the “Where to Stay, Play and Drink Rose” travel series, and if you’d like to see my other travel guides on Santorini and Mykonos, Greece click HERE and Istanbul, Turkey click HERE. This post is specific to Provence, the countryside of France, and I will follow with my Cote d’Azur (Saint-Tropez and Nice) travel guide next week. I chose to break it up into two parts when I saw how incredibly long my details were becoming. I also think that often people choose to visit one or the other, rather than both and pair it with a trip to Paris, so I thought the organization of the posts made more sense to readers. I appreciate comprehensive travel guides, and I hope you enjoy the strong attention to detail that shows what an incredible trip it truly was. First of all, I would say the key to conquering the South of France would be to pick a couple places to “settle” for 2-3 nights and rent a car so you can spend your days taking small trips to other local towns. This allows you to capitalize on a short amount of time in one area without feeling hectic and rushed to pack up your bags and move on to the next place. After all, the South of France is very small (about 8 hours driving distance from Provence to Nice), but each town is very different, so you want to make sure you soak up all of the different cultures. 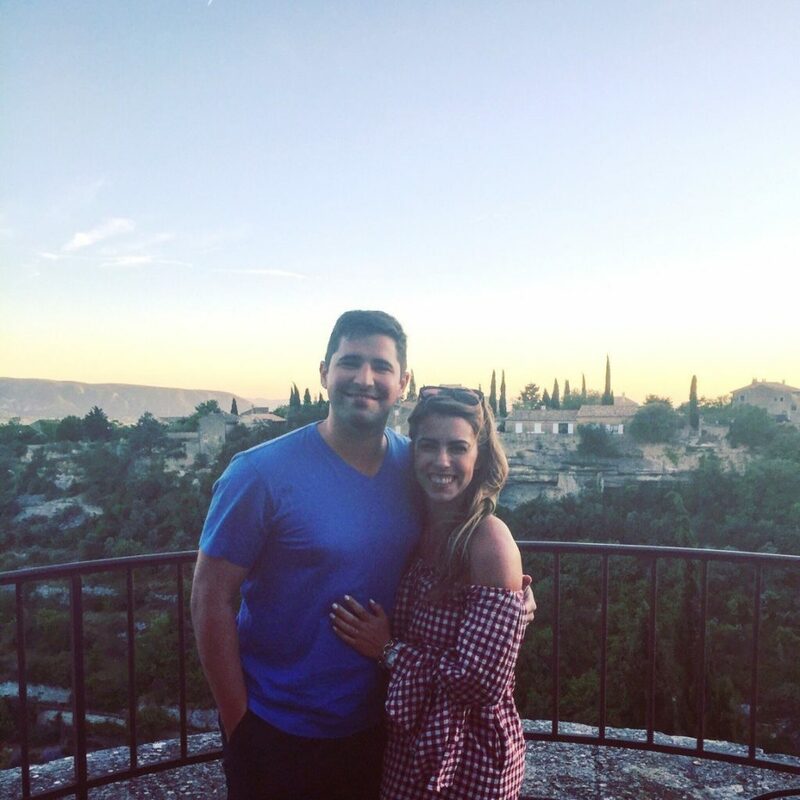 I personally think Drew and I could have done a better job planning our day trips so that we could have seen more towns, but we were happy with what we saw because we never felt rushed throughout our trip. We spent nine total nights in the South of France, and we felt it was the perfect amount of time to be away and still see the majority of what we would have liked to see. We spent four nights in Provence, two in Saint-Tropez, and three in Nice. I absolutely recommend that you rent a car, a very small car (parking is limited, but they drive on the right side of the road, thankfully) in order to maximize the trip. It will make it very difficult to see what you want to see in a short amount of time if you don’t have a car because most of the cities are anywhere from 15-30 minutes apart. Taking the train would require you to travel north back to Avignon in order to get to both Saint-Tropez and Nice, which could take hours. It’s simply not practical in a 9-day vacation. We traveled from Charlotte to Paris on a direct flight. Once we arrived in Paris we jumped on the TGV train from the Paris train station at the airport and took it to Avignon train station. The train ride was close to 3 hours. You could also take a flight directly into Nice and do the trip backwards from Nice to Provence, but flying into Paris was cheaper for us. We bought our train tickets on the SNCF website HERE. Avignon is one of the larger towns in Provence, and Provence is essentially the countryside of the South of France. Upon arrival in Avignon we jumped in our mini car and we were on our way to our first hotel in St. Remy, Vallon de Valrugues. While in St. Remy we took day trips to Chateaneuf de Pape, Gordes in the Luberon Valley and spent time in the center city of St. Remy, which was the most adorably charming town. From St. Remy we took a 2-hour drive to Saint-Tropez, where we stayed at our splurge hotel, Chateau de la Messardiere. The hotel was incredible, so we decided to take this time of our trip to relax by the pool and enjoy the hotel’s beaches. We didn’t do any day trips while in Saint-Tropez. Following our time in Saint-Tropez, we traveled on to the larger metropolitan city of Nice where we stayed in Old Town on the Promenade at Hotel La Perouse. While in Nice we took a trip to the Villa Ephrussi as well as the medieval town of Eze, which was incredible. Eze is essentially the Santorini of the South of France. Breathtaking views and gorgeous passageways. One place I would have liked to travel to that I heard great things about was St. Paul de Vence. Unfortunately we were out of time and didn’t want to pack too much into Nice without actually enjoying the city of Nice itself, so we chose to pass on that day trip. 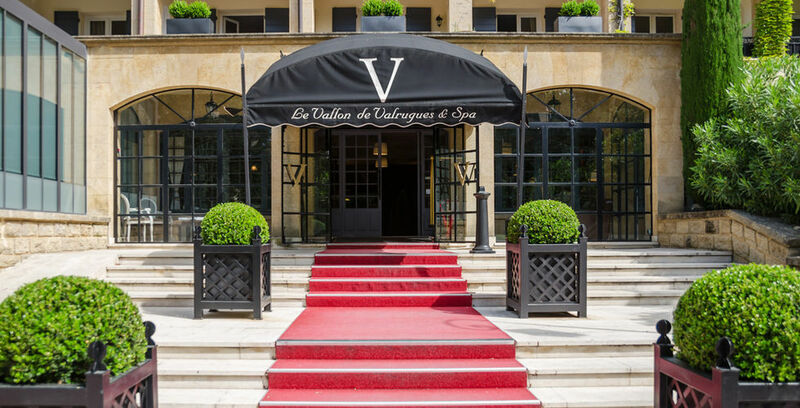 Where to Stay: Our hotel in Provence was Vallon de Valruges located in St. Remy. We chose to stay in St. Remy as opposed to Avignon (where many people choose to stay while visiting Provence) because we felt it was more boutique and quintessential to France. We were looking for beautiful cobblestone streets, adorable cafes, and flower and vine covered walls. Not that Avignon doesn’t have all that, but we truly wanted more of a small town feel that would have less noise. We found that it was an amazing choice not only because the hotel was incredible, but also because the town was very easy to travel in and out of when we took day trips to other towns. It is relatively centralized and very little traffic, so the convenience factor was a huge plus. Our hotel was a 5-star hotel, but also surprisingly very affordable. The rooms were small as you would expect from a European hotel, but the grounds were gorgeous and the staff couldn’t be more accommodating and friendly. During one of our mornings Drew and I chose to get massages at the spa of the hotel, and I will say I wasn’t very impressed with the services. However, Drew absolutely loved his massage, so it could have been the masseuse that I had. Where to Play: Drew and I spent four nights at our hotel in St. Remy. 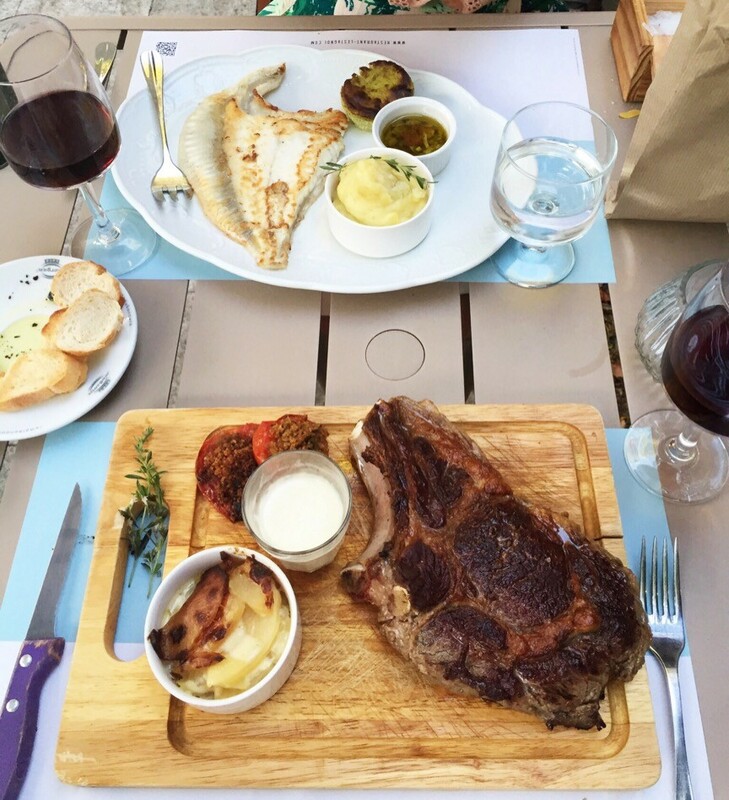 When we arrived at the hotel, we settled in and went to dinner inside the town of St. Remy. The hotel offers a shuttle service to the town center for only five euros a trip. It was worth it because we could enjoy an extra drink at dinner and not have to worry about parking. Day two we took a day trip to Gordes and the Luberon valley to visit the Senanque Abbey, a beautiful monastery still occupied by Cistercian monks. It is famous for its beautiful lavender fields that line the front of the building. We had no interest in doing the tour, but you can go inside for a small fee. Heads up: if you are allergic to bees as my husband is, I recommend you avoid the lavender plants. 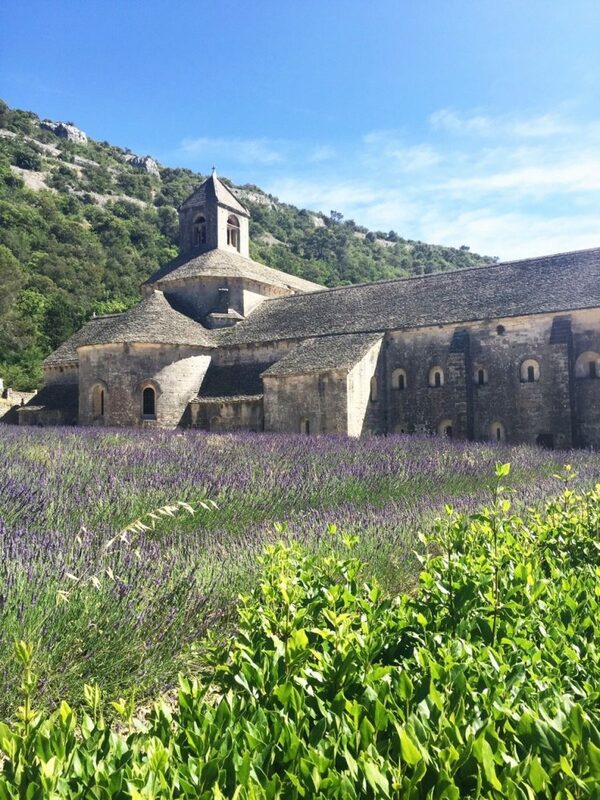 The monks breed honeybees and the lavender plants are full of bees that live in the area. I nearly threatened his life for the “perfect” blog pic! whoops… At lunchtime that day we traveled onto Gordes, which is a gorgeous mountain top town that overlooks the Luberon Valley. Again a wonderful opportunity for breathtaking views and amazing photos. 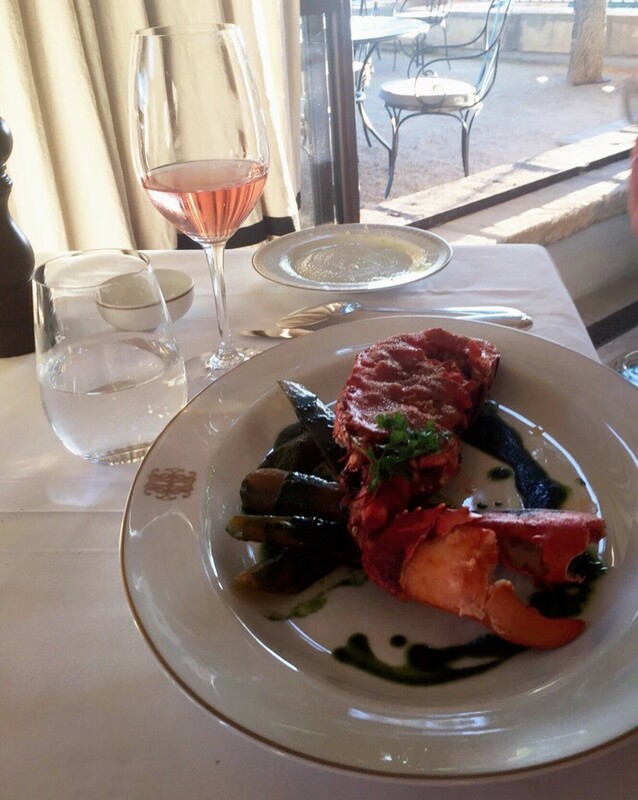 We spent some time touring the town, eating gelato and made dinner reservations at one of the best spots in town. More on restaurants in a little while. Photos we took where I nearly sacrificed my husband’s life, do you think it was worth it? haha, totally jk. Outfit post HERE. 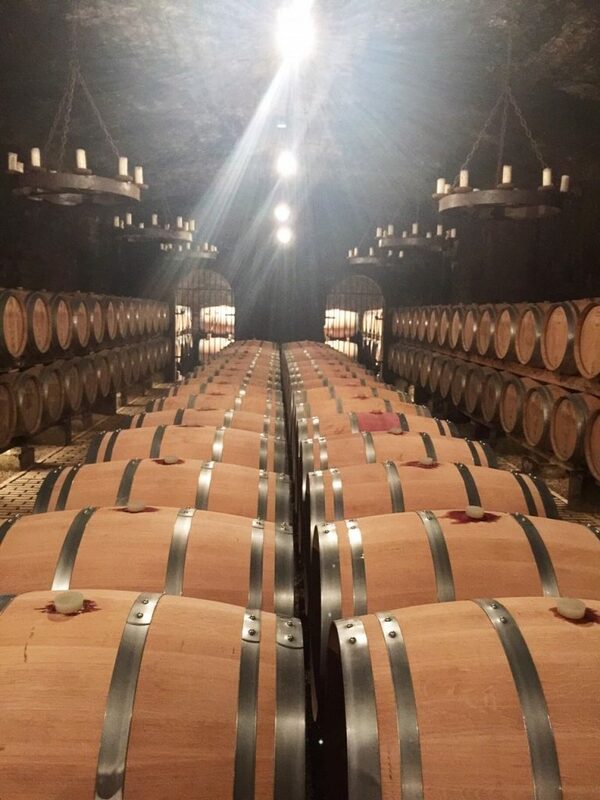 Finally, on Day three we took a day trip to Chateaneuf de Pape, which is essentially one of the many “Napa Valleys of Provence” famous for it’s GSM Cotes du Rhone red blends (Grenache, Syrah and Mouvedre) and rose, for a wine tour at a couple of the vineyards. The name of the company we used was WinePrestigeTour.com. I can’t remember the exact names of the wineries we visited because the company chooses the best ones to visit on that day based on winery availability and weather. We had a wonderful time because we met three other American couples and really got to know them during the tour. Unfortunately they were staying at hotels in other towns so we weren’t able to meet back up with them. 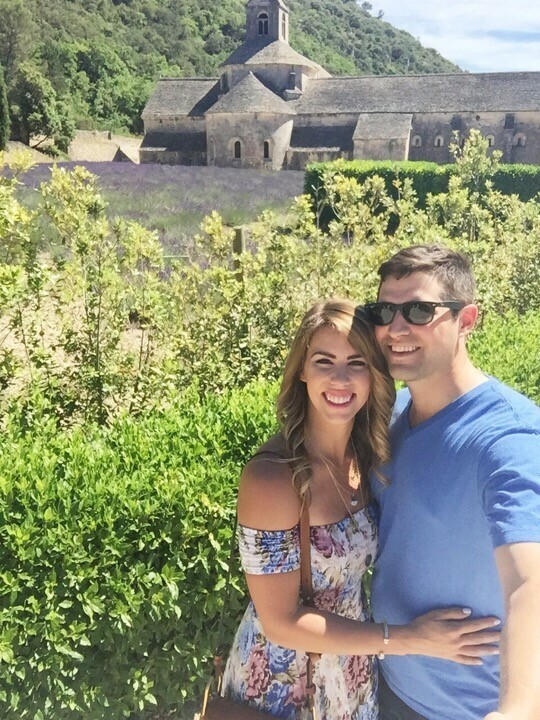 Photo in the vineyards, how crazy is the ground the vines grow in? Our guide told us those rocks are actually 10 feet deep into the ground! Following the tour we traveled back to our hotel for dinner at the hotel restaurant. If we had one more day in Provence, I would have considered traveling to Arles, another unique French town with Roman influence known for its art and history, and passing through the Camargue, which is coined pland of the Gypsies and meeting place of the cowboys, lol! It’s essentially very unique and similar to the “wild, wild west of France.” You can expect to see swampy plains, flamingos and beautiful white horses. It sounds so interesting to me, I just wanted to see it, but unfortunately other towns were higher priority on our list, and you do have to pick and choose what’s most important to you. 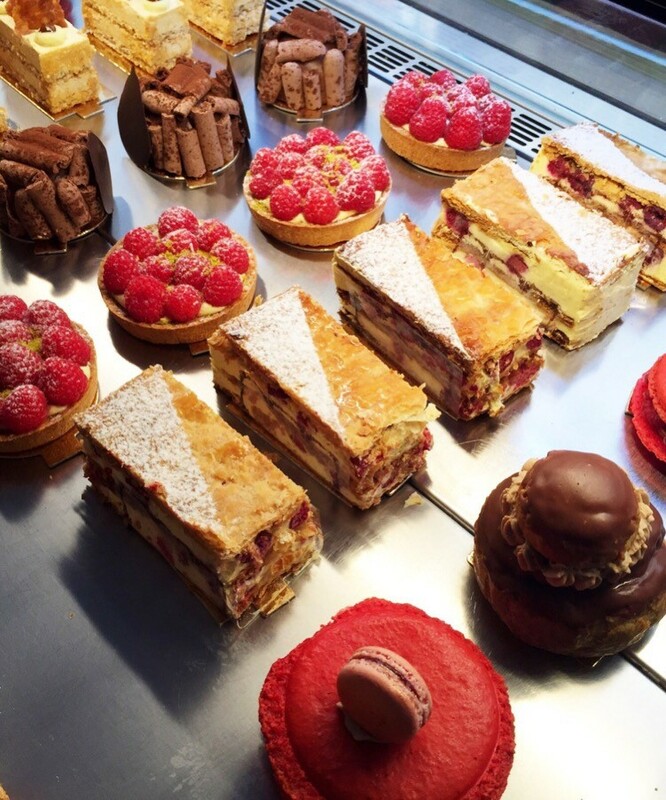 Where to Drink Rose (lots of it, and eat! ): This is the topic I know you are most interested in because it’s my favorite, too! 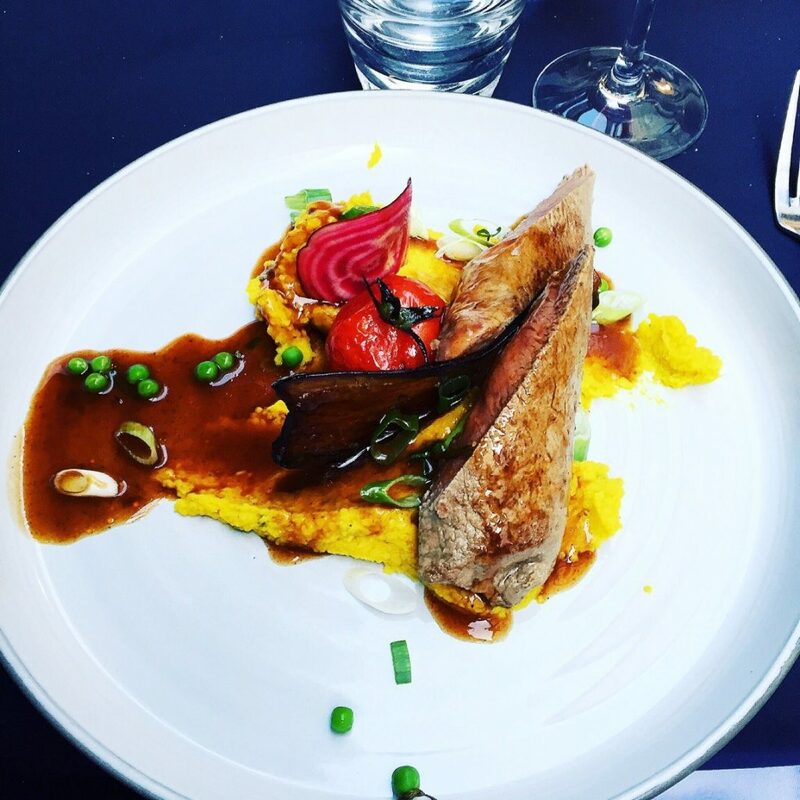 We ate at some of the most amazing restaurants while in France, but Provence food was exceptional because they truly pride themselves on their food and wine. 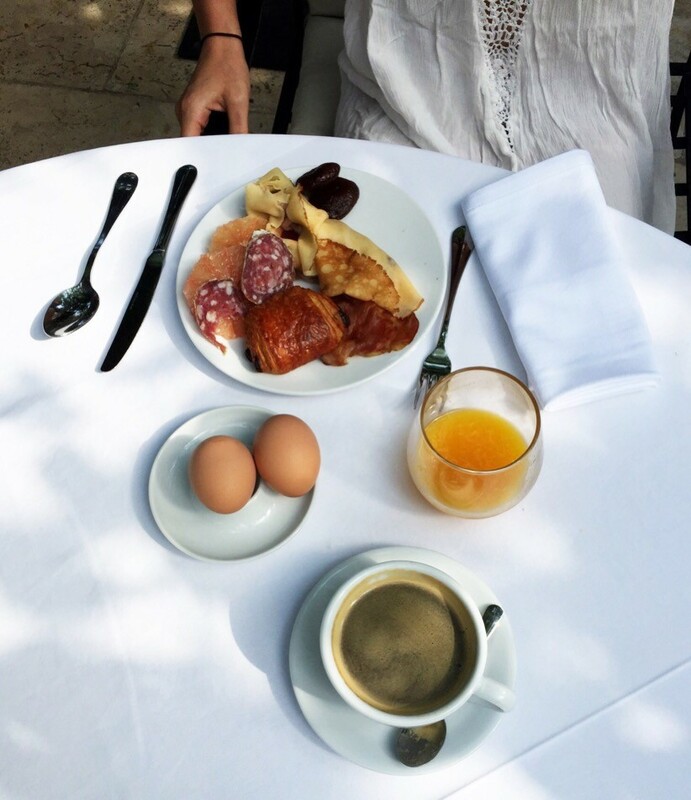 We always ate our breakfast at the hotel because they had a ridiculous spread of breads, meats, cheese, fruits, and traditional breakfast items, not to mention an espresso machine, yum! It was not included in the price of the hotel, but we felt it was worth it to get our day started early. Lunch was usually grabbed quickly while sightseeing or along our road trip at a small cafe, coffee shop or gelato hot spot and included antipasto trays or meat and cheese sandwiches. Where we really splurged for meals was dinnertime, which is what I feel most people do while traveling and sightseeing. Dinner on night two was once again in the center city of St.-Remy following a relaxing day by the pool. 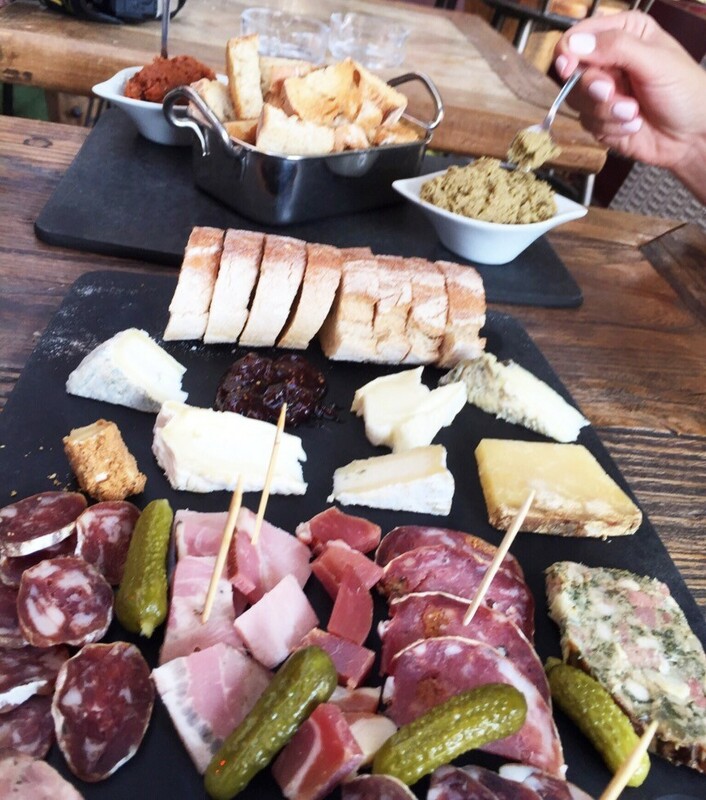 We enjoyed an antipasto plate and a glass of wine at a small bistro called Bar Restaurant and then traveled on to our dinner location at L’Estagnol. Once again, we ate dinner on the patio and the food was outstanding. I ordered the fish of the night and Drew once again had the beef. Funny video of me being serenaded by the Gordes band, I seem to be enjoying it though…? Last but not least, we chose to do our final dinner at our hotel restaurant so that we could relax and not worry about dinner reservations before getting on the road the next day. Isn’t the restaurant so romantic? 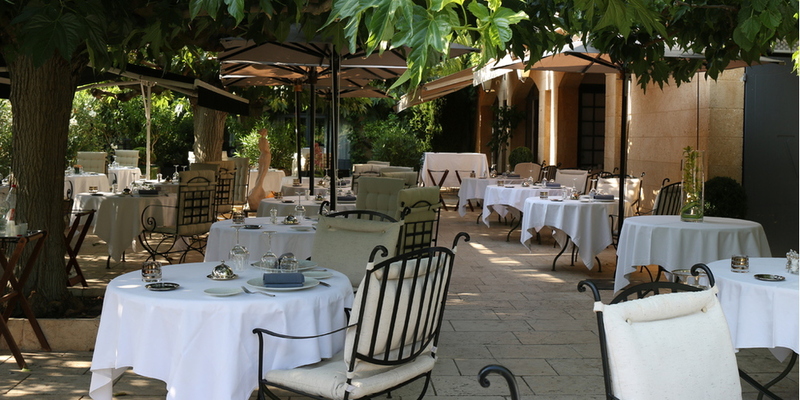 Tips: Tips in France are not expected, though they are appreciated for exceptional service. Any time Drew and I had an outstanding meal with amazing service, we left a 10% gratuity on top of our bill. Generally the bill will not automatically include itinerary but you should still check the bill to make sure it was not already included. Cabs: Cabs were not difficult to come by, but thankfully we did not need to use one due to renting our own car and using our hotels’ shuttle services. Our concierge told us that cabs generally only take cash, and there is a possibility they may rip you off if they realize you are a foreigner. If you use a cab, make sure to ask how much the ride will be prior to entering the cab, so that you’ve settled on an agreement. Currency: None of the businesses or restaurants accept U.S. dollars. I recommend you have anywhere from 30-50 euros on you at anytime for tips and small purchases (a lot of places require a minimum purchase price to use a credit card and you don’t want to be stuck in that position). For the majority of our purchases, we used an international credit card that doesn’t charge an exchange fee. My personal favorite is the Capital One Venture credit card (it is the navy blue card). Disclaimer: I do not have a endorsement with Capital One, and all opinions are strictly my own. Language: Neither Drew nor I speak French. Because the South of France is a touristy area, most of the locals speak English. If you do encounter situations where they do not, it is likely in some of the smaller towns in Provence. My best recommendation is to learn a couple of small intro phrases in France our of courtesy prior to switching over to English to ask your question. Something like “Bonjour monsieur, parlez-vous anglais, or no? (hello, sir, or madame, do you speak english or no? )” generally does the trick to ensure you’ll get an answer to your question. Culture: One thing Drew and I were incredibly surprised about is that the French stick to their schedule of opening and closing hours regardless of their incoming business. There were times throughout the day where we were ready to sit down and eat lunch or have a snack and the bistros and cafes were closing and kindly declined additional business. Generally in the U.S. we continue to stay open if it means we were serving someone. I found this refreshing because they truly valued their break and rest time over additional revenue. We could use a little more of that in the U.S. With that said, definitely pay attention to opening and closing hours and don’t assume a restaurant will stay open for you to eat there. Along the same lines, make sure to make reservations. 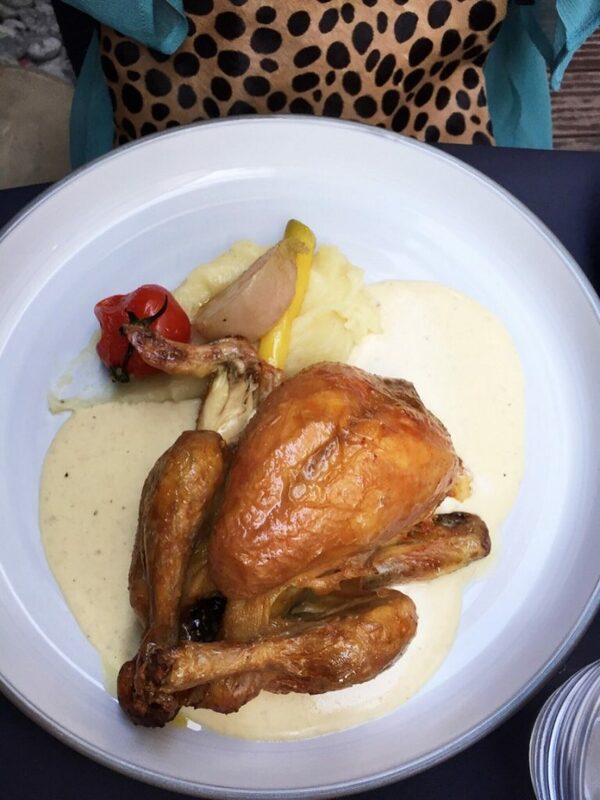 The French love to sit and enjoy their meals without being rushed, so there is no guarantee you will get into a restaurant if you put yourself on the waiting list. 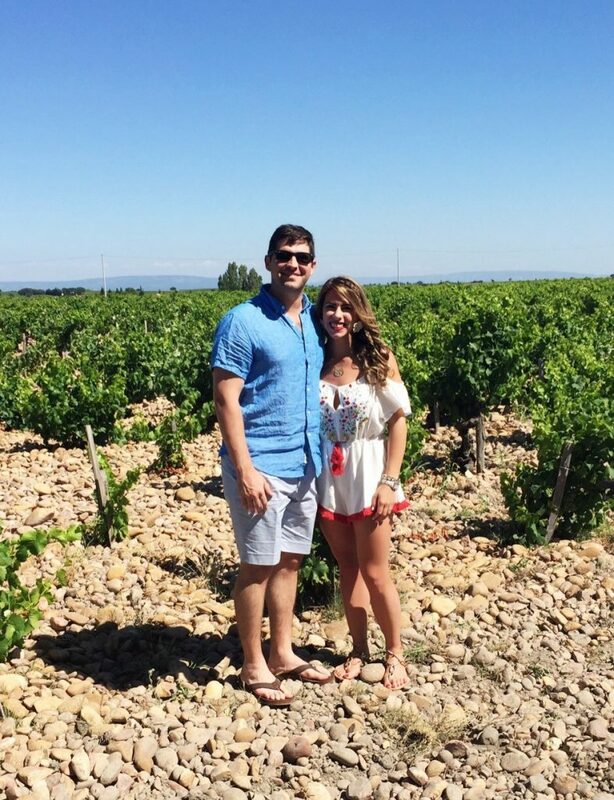 Safety: Honestly, Drew and I felt incredibly safe the entire time we were in the South of France, but at the same time, we made sure to listen to our concierge and never ventured into risky areas of the towns we visited. I think this was most important in the city of Nice. Our concierge was very strict to tell us not to venture out of the Old Town area, and I definitely understand the concern. Be sure to check in with your hotel and get an idea of the surrounding area before making risky travel decisions. That was so much fun recapping our trip! I hope you enjoyed it as much as we both did. As always, if you have any questions regarding any of our travels, please feel free to leave it in the comment section below and I’ll do my best to respond to them! Hope you have a wonderful weekend!